When asked what I do for a living, my response is usually “Lapidary”. This inevitably gets the “Huh?” response. Most people have no idea that there is a lapidary field and that lapidary may quite possibly be one of the oldest professions! A lapidary is an artist who practices the craft of working, forming, and finishing stone, mineral, and gemstones into decorative pieces or wearable items. In prehistoric times, man learned to make tools from stone, using one stone to chip away at another, and in the process learned that stones could be worked and that they had different hardnesses. By 3,000 B.C. man had developed his lapidary skills to such an extent that they could make cylinders from serpentine stone. In all ancient civilizations history records the cutting of natural stone for tools and adornment. Beads, scarabs, amulets, seals, even bowls were cut from stone. It is believed that around the 1300’s early faceting occurred. But in the 1400’s real developments began. Grinding wheels were developed, shapes were improved upon, and better polishing rock techniques emerged. The lapidary field of gem cutting for jewelry began to divide into two techniques. Faceting-described as to place and polish facets onto a mineral specimen; and cabochon cutting or cabbing-described as shaping and polishing a stone usually with a convex top and a flat bottom. Traditionally semi precious stones or opaque and translucent stones are cut into cabochons and transparent stones are faceted. However that distinctive has become more blurred as fantasy cuts, sculpted stones and carved stones have hit the market. The town of Idar-Oberstein in Germany soon emerged as the gem cutting capital of the world. 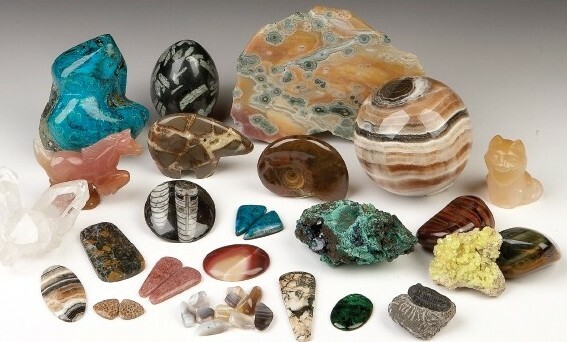 According to historical records, miners in the late 14th century found agates not far from the tiny towns of Idar and Oberstein and began to cut it into cabochons and sculptures. The actual history of the industry there probably predates the existing records of it. It is known that mechanized mining operations for the extraction of stones within the vicinity of the towns, began in the late 1400s, creating a demand for gem-cutters, and stone-carvers who migrated to the area. By the start of the 18th century, there were about 15 cutting gem shops. This number doubled by the beginning of the 19th century. A large boom occurred when German emigrants discovered large agate deposits in Brazil and brought the material back to be cut. By the late 1800s, there were more than 150 gem cutting shops in Idar-Oberstein. In China, lapidary work specializing in jade carving has been continuous since the Shang dynasty. But in the early 1900’s it emerged as the place where mass amounts of commercial cabochons could be produced cheaply. To this day there is no way Americans can compete in that market. For this reason, up until the 1960’s any lapidary work done in America was mostly just for hobby or competition. The 1970’s saw a strong surge in the craft market, and the 80’s was a time when it was big to “invest” in gemstones. Still it wasn’t till the late 1980’s when lapidary really took off in America, and the American lapidary market began to emerge as the leading lapidary in the world. Unfortunately the general public still thinks of gemstones as diamonds and rubies, with maybe some knowledge of tiger’s eye and onyx. Even the turquoise boom in the 70’s failed to introduce opaque gemstones to the public. Mention chrysocolla or chalcedony to somebody not in the field and you are likely to still get that “huh?” response. The rise of the metaphysical belief in energy of healing crystals and healing stones in the last 20-30 years has definitely made people more aware of the rock and mineral field. But we still have a long way to go. There are now a large number of American designer cabochon cutters, and most of them have good originality and skill. I believe their craftsmanship is the best in the world. Custom jewelers have a great array of cabochon stones to choose from. This pushes the cutters to always look for new and unusual gemstone materials and to try different shapes too. Unfortunately their efforts are not cheap. Perhaps understanding the process can help jewelers and the public begin to appreciate the stones available to them.